The OSSLT testing does NOT go as planned by both EQAO and school officials. 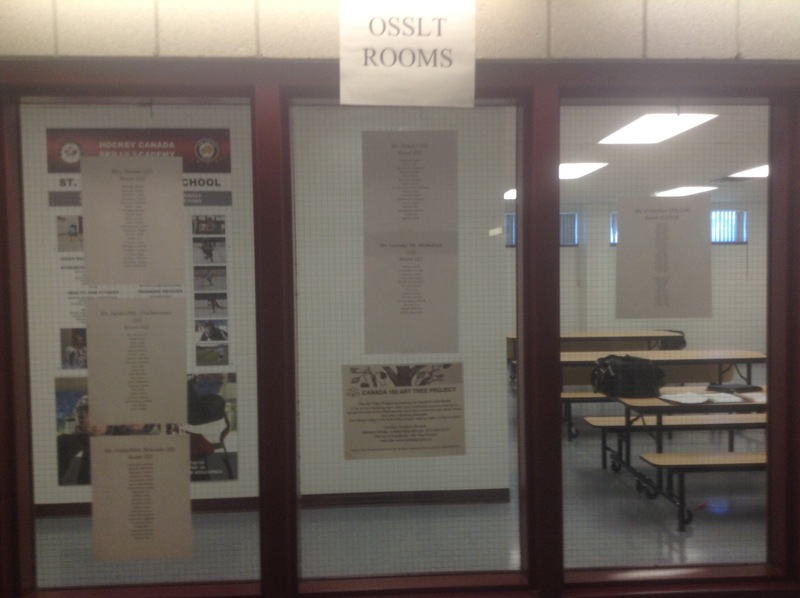 The grade tens of Saint Joseph’s High are prepping for the first online OSSLT (Ontario Secondary School Literacy Test). Workshops were held to introduce the students to the style of testing in hopes of having everyone ready. Testing will be held during periods one and two tomorrow morning! Be ready. To find out what room you’ll be writing on please consult the window of the student lounge, your rooms will be posted there. Be sure to stop by the trophy case in town square and read about our actors/actresses who played roles in our schools play Godspell. Jenessa linton and her group about to check out the SJHS weight room. Starting March first, there will be workshops set up for the upcoming literacy test on March 31st. These workshops are for graphic text/grammar, series of paragraphs expressing an opinion, summaries and short writing tasks, newspaper reports, and multiple choice. These workshops will run from March 1st to 16th. This will give students extra help to prepare for the literacy test. Today, the grade 8s from all feeder schools come to ST Joseph’s Catholic highschool to tour our school and experience what we have to offer. All the grade 8s meet in the gymnasium to have the giant handshake before being separated into groups to tour the school. After lunch, many games and activities are set up in the gymnasium. All afternoon they will play these games until the end of the day where they will watch a video that captured the spirit and liveliness of our wonderful school. For any questions or concerns about student help at St. Joseph’s, see Mrs.Watters in student services. St Joseph’s 2016 Career fair took place today, January 15th with a wide range of Career choices for students to browse and consider for future careers.